I will try not to do what everyone else reviewing this book has done and continuously reference Harry Potter, but seriously, just because HP changed your life and defined your childhood ( like it did mine), does NOT mean you will like this book. It seemed fitting for me that, having grown up with HP, Rowling would publish her first adult fiction novel the year I turned eighteen. But I've been reading adult fiction for a while now , so when I started reading 'The Casual Vacancy' I wasn't blown away by the drastic change in genre. This book is definitely not for younger readers, and I stress that point whole heartedly. The book begins with about a two hundred page introduction into characters and setting, which a lot of people seem to have a problem with, but I fortunately didn't. Don't be discouraged if you don't like this sort of character driven fiction, the plot picks up before the half way mark and really pulls the reader in. This book has received a lot of criticism for it's 'bad' language, violence, sexually explicitness and downright unpleasantness. Not that I can claim to live in the society that some of the characters in this book do, but I know for a fact that some real people act, speak and think like the way the characters in the book do, and if Rowling wanted to capture real life, she was very accurate in her portrayal of some people in our society. The book has also been criticised for it's lack of likeable characters, but I can't remember the last time I read a book with characters more realistic than this one. Sure most of them are basically messed up wrecks of flaws and weaknesses, but that's quite an accurate description of a lot of people in real life. It's the characters pettiness, selfishness and cruelty that drives the plot, so without these deeply flawed characters the book wouldn't have worked. The characters never really earned my sympathy, despite the truly heart wrenching ending, but that didn't stop me for calling out for the sequel that so many others are asking for aswell. Nothing amazing happened in this book, which is the polar opposite to HP, (crap, a comparison) but that's nearly what's great about it. The mundane-ness (is that a word??) of this book is striking, how nothing remarkable happens and yet I was captivated by it. It's a fantastic book about how we can make others lives better or worse by the little things we do and the way we behave. 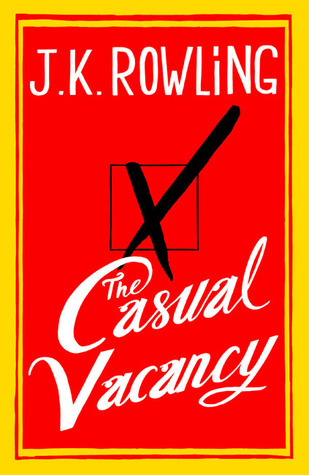 I don't give out five stars lightly, and 'The Casual Vacancy' definitely deserves all the stars I can give it. I wouldn't change a thing, except perhaps the ending, but I won't spoil it for you guys.